The team at the Isle of Arran Distillers is celebrating four coveted awards at this year’s International Wine & Spirits Competition. The independent whisky maker picked up two gold medals for its Arran 10 and 18-year-old Single Malts. The Bothy Quarter Cask and Lochranza Reserve claimed silver outstanding medals. The International Wine & Spirits Competition is now in its 49th year and sets the international benchmark for quality. Entries are received from nearly 90 countries and each product is sampled by the judging panel, which consists of over 400 global experts. 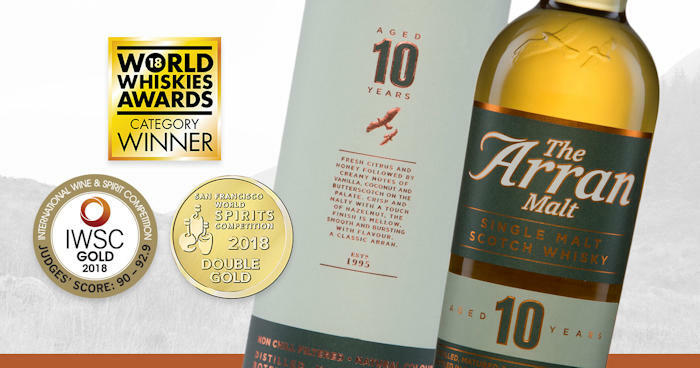 The gold medal for the 10-year-old Single Malt at the International Wine & Spirits Competition is another in a long list of sought-after accolades that the classic expression of Arran has received. Earlier this year the dram collected the Double Gold accreditation at the San Francisco World Spirits Competition, a Gold medal at the World Whiskies Awards and an impressive 91 points out of 100 at the Ultimate Spirits Challenge, where it also received a cocktail commendation for the ‘Rob Roy’ cocktail. Expert judges from across the world have been impressed with the 10-year-old’s initial rush of rich vanilla sweetness that gives way to a touch of cinnamon that adds a spicy edge to the soft and sweet texture. The citrus notes have rounded with age and reveal new depths of character against a background of sweet oak. The 18-year-old Single Malt, that claimed a gold award at the International Wine & Spirits Competition, following a Gold Medal at the World Whiskies Awards earlier this year, is a favourite among whisky lovers for its renowned depth of character. Caramelised citrus and tropical notes on a background of toasted oak have created an intense, well rounded dram with charm and personality. This Single Malt also utilises a balanced mix of the finest aged ex-Sherry and ex-Bourbon casks to offer a full and unique maturation of the classic expression of Arran. Speaking about the awards, Euan Mitchell, Managing Director of Isle of Arran Distillers, said: “It’s always exciting to see our whiskies perform so well on the international stage, and there aren’t many more prestigious than the International Wine & Spirits Competition. “Our whisky represents much more than just a great taste, they also characterise the heritage of our island. The local water, microclimate and air quality all influence the spirit as it’s distilled and matured. The whisky we create couldn’t come from anywhere else but the Isle of Arran. Everything we make reflects a range of regional influences yet achieves a rare and unique personality all of its own. The most recent milestone for the Lagg Distillery is the completion of the steelworks. With the structure now in place, the Distillery has begun to take on its distinctive shape, overlooking the south coast of Arran and the Firth of Clyde. The new distillery has been positioned next to fields of barley that provide a portion of the malt currently used in distillation at Lochranza. Come this autumn the copper pot stills will be installed, followed in early 2019 by the first production run of the new heavily-peated (50ppm) spirit that will become, in time, the flagship Lagg Single Malt Scotch Whisky. The Isle of Arran Distillers has released 700 of the first casks of this whisky for purchase. Each of casks, priced at £6,000, will remain at the distillery for a minimum of ten years of maturation under the careful eye of the Lagg Distillery team. The casks owners will then have the opportunity to bottle the spirit, complete with a limited-edition Lagg Cask society label, or pay an annual fee to continue the maturation process until the desired age is attained. It is expected that the casks will be laid down in early 2019. No further casks will be made available for sale to the public during the first ten years of production at Lagg.